Want to stay on top of your fitness and nutrition goals this fall? Great! 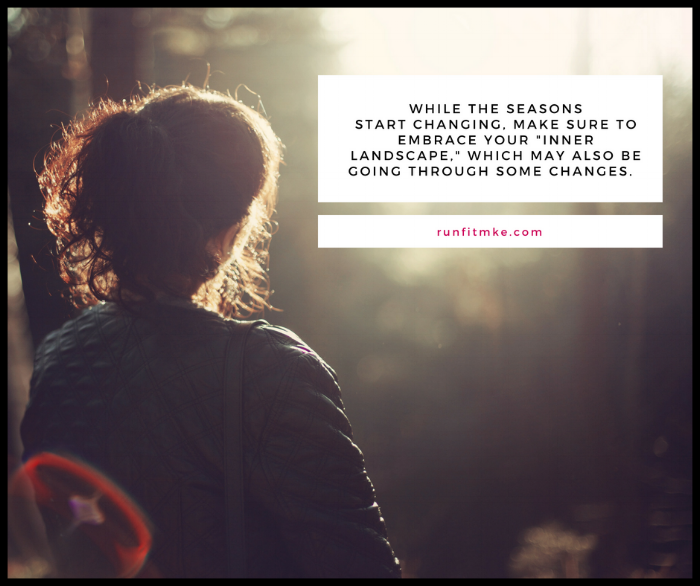 I've got a few healthy tips for you to consider as surviving the change in season can be tough. Autumn isn't just about adapting to the shift in cooler weather. The days get shorter and darker. There is less access to locally-grown fruits and veggies. And, for many of us, our activity level decreases (and our interest in comfort foods increases!). 1. Enjoy the Activities the Midwest Offers. If I'm being completely honest, this is might be my favorite time of year. While we can't always predict rain or shine, Autumn in Wisconsin is full of vibrancy and there are so many fun things to do to keep your spirits lifted! From chili cook-offs to tailgating to haunted houses, I encourage you to make the most of the season by exploring the great outdoors and connect with people in your community. Click HERE for a list of awesome September - November activities and get out there! 2. Engage Your Mind & Body. "We love to turn our home into a movie theater and marathon scary flicks in the fall! While our brains are fully engaged, our bodies aren't. And we always feel (and see!) the difference. Last year, we incorporated 5-10 minutes of exercise between each film, which kept our bodies moving and the lbs. away." Yes. Curl up and read a good mystery. Take a nap, if you can. Watch some of your favorite seasonal flicks. Relaxation is very healthy. It's also important that you don't get too comfortable. You still need to engage your body, in whatever way that works for you. 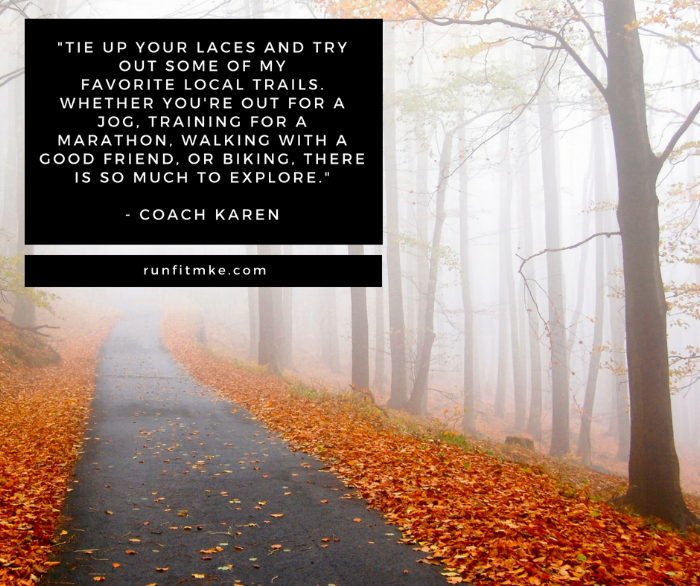 I encourage you to tie up your laces and try out some of my favorite local trails. Whether you're out for a jog, training for a marathon, walking with a good friend, or biking, there are so many ways to keep active. * Cheer for me on October 7th as I run my 6th consecutive Chicago Marathon, running with the American Cancer Society. 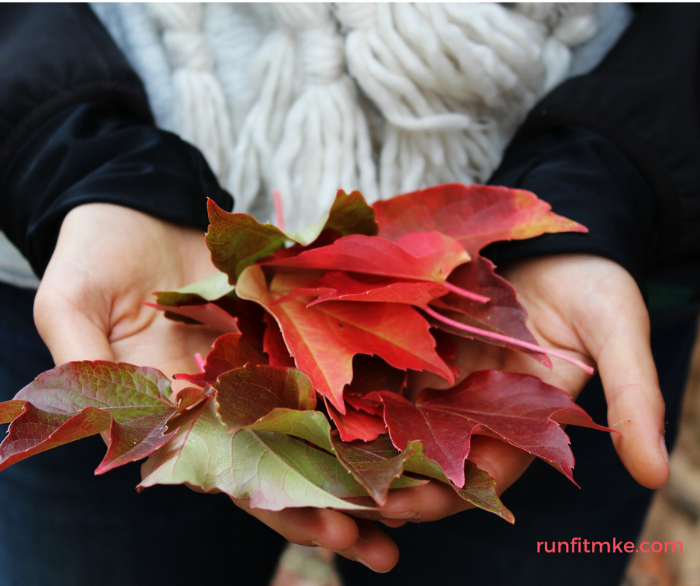 If you're running a marathon this fall (whoot! ), click HERE for some of my tips on best training practices. Here in the Midwest, most of us see a shift in how we eat when cooler weather comes along. Why? We have less access to fresh produce. It's also part of our make-up that we crave heartier, fattier foods. I always tell my clients...if you're maintaining and not gaining weight, you're managing just fine. What's a great way to stay on track of your diet this time of year? 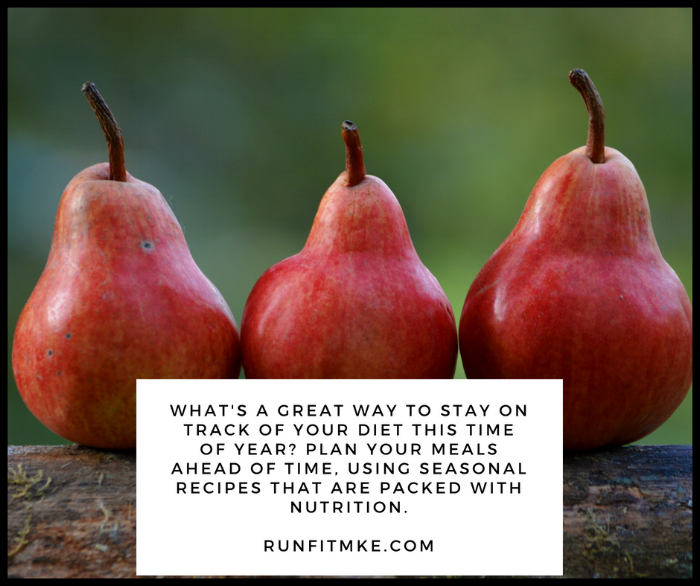 Plan your meals ahead of time (learn more HERE), using seasonal recipes that are packed with nutrition. I've taken the liberty to create a Fall Recipe E-book - just click here to open and download. Also, remember that the holidays are just around the corner, which can often mean table spreads of all your favorite foods, sugary seasonal beverages, and less sleep. Check out a few tips on how to be mindful throughout the Holidays HERE. 4. Explore Your 'Inner Landscape." While the seasons start changing, make sure to embrace your "inner landscape," which may also be going through some changes. "Whether we realize it or not, our inner landscape is undergoing its own transition, right in alignment with the change in season. Our bodies instinctively adjust when the days get shorter and the temperature gets cooler. Yet, sometimes that adjustment period can get stifled by a toxin build up. A few too many sweet summer cocktails, greasy BBQ fare, and lack of sleep can leave us with an abundance of bad stuff and a weakened immune system." Also remember: Seasonal Depression is real. While the emotional scale is different for everyone, we all experience the effects of the season changing, in on way or another. It's important to plan ahead for the colder months. How will you take care of yourself as when some of your habits or outlets change? "A friend recently asked, 'I'm worried about you this winter - you won't have your garden and I know it's your way of keeping your spirit happy.' I replied, 'the fact that you know that about me is so important - thank you. It also makes me realize that I need to have an indoor hobby to keep me engaged and uplifted." Whatever hobby you discover this winter, just remember this: be kind to yourself. Pay attention to what your mind and body need throughout the seasonal change. And, if you do take up something new and interesting, let us know! We'd love to hear about it. If you're not a RunFit MKE client, maybe it's time to consider having a Personal Trainer and Nutrition Coach. We can help hold you accountable to your goals during the change of season. We're located in the Historic Third Ward and can work around your busy schedule.